Can a filmmaker make a biopic with a book as its protagonist? 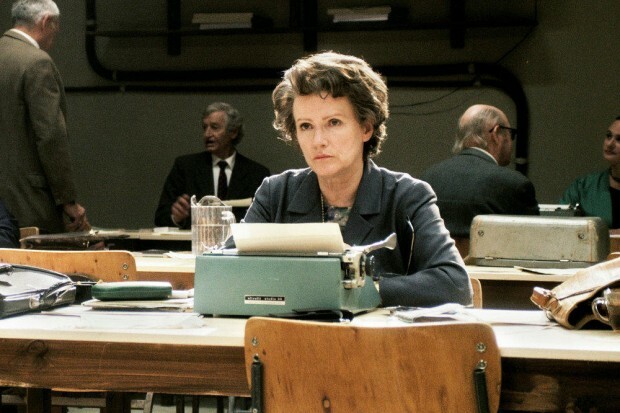 Margarethe Von Trotta’s film, Hanna Arendt, is a film with a limited scope, following Arendt during the publication of her book Eichmann in Jerusalem in 1963. The film stacks the deck decidedly in its protagonist’s favor, but its methods expose the threadbare hero it hallows. Eschewing any serious consideration of the sustained critical response to Eichmann in Jerusalem, Hannah Arendt prefers hagiography. It is a one-sided argument, so intent on ensuring Arendt’s victory that it adulterates the very nature of the conflict over Eichmann, and over the legacy of Arendt’s thought. Arendt’s primary purpose in Eichmann, a book that emerged from a series of New Yorker pieces, was to demonstrate “the banality of evil”—the ways in which a simple Nazi clerk could play handmaiden to mass murder without ever understanding or acknowledging the horror of his deeds. Eichmann, by her reckoning, bore the Jews no special animus, intent merely on carrying out his duties to the utmost. The film's methods expose the threadbare hero it hallows. Hannah Arendt is sympathetic to many of the claims Arendt makes in her notorious book, but it is the film’s handling of the Judenrat controversy (which arose after Arendt’s articles first appeared in The New Yorker) that most clearly demonstrates its allegiance to the myth of Arendt as fearless truth-teller. Forever surrounded by tottering piles of trial transcripts, her opinions are presented here as above debate. “But it’s a fact,” Arendt insists to one of her critics about her Judenrat allegations, puzzled that anyone could take umbrage at her line of argument. Her work is in the service of truth, where others’ is presented as nefarious and self-interested. Arendt’s tormentors here are bullies, shrill ideologues who value politesse over honesty. They are embodied by the rat-faced fellow academic who scowls at each of Arendt’s orotund pronouncements and hisses at her conclusions. (Subtle this film is not.) Arendt argues that the bulk of her critics are “dimwits” who likely have not even read her articles. The film relentlessly endorses her unlikely assertion; the critics of Eichmann in Jerusalem are crank callers and the elderly neighbor who sends Arendt a profane message. No one is allowed to calmly rebut her, or to voice the obvious critiques of Arendt’s work: that it was indifferent journalism, that its philosophical bent amounted to a defense of Eichmann (as Judt put it, “Jews seemed to become ‘responsible,’ Germans merely ‘banal’”), that its attacks on the Judenrat emerged less from the historical record than Arendt’s own deeply conflicted relation to Judaism as a self-identified scholar and representative of German high culture. And thus the cinematic Arendt blithely carries on, oblivious to the attacks, calmly assured that she need listen to them no more than her critics have apparently listened to her. The film inoculates its protagonist, placing accusations of coldness, lingering Germanophilia, and disregard of anti-Semitism in the mouths of unsympathetic or intellectually insignificant characters. These valid criticisms are paid cursory lip service, and the film quickly moves on. The film’s bluntness is especially disappointing given that Von Trotta has handled challenging material before. The underrated Rosenstrasse (2003), for example, which depicted the wartime plight of German women married to Jewish men. But such subtlety is not on display here; setting and language, in particular, make the film stumble. Scenes set at the offices of The New Yorker are comically campy, and even the usually dependable Janet McTeer, as Arendt’s friend and confidante Mary McCarthy, wildly overacts. Barbara Sukowa as Hannah Arendt. The film also inadvertently undermines some of its more strident points. Hannah Arendt makes crafty use of original film footage from the 1961 Eichmann trial (much of it now accessible on YouTube). The audience sees the actual Eichmann, not some celluloid doppelganger, as well as the real and harrowing testimony of survivors and the eloquent prosecutor, Gideon Hausner, speaking on behalf of the dead. Despite Arendt’s claims, this is no Soviet-style show trial. The film also presents Arendt as a loner. “I’ve never loved any people,” she later tells an old friend. “Why should I love the Jews?” But the warm friendship between Arendt and McCarthy in the film undercuts the argument. Evidently, Arendt could love some people, just not the Jewish people. In the film’s strangest, quasi-surreal touch, Arendt is stopped on a lonely, deserted road by a trio of Mossad agents. They seek to intimidate her into withholding publication of Eichmann in Jerusalem, insisting on its potential harmfulness. “You burn books,” Arendt scoffs, “and you lecture me.” The reference is deliberately pointed; Israelis are the new Nazis, using force to demand acquiescence from their enemies. The scene echoes Hannah Arendt’s first scene, in which Eichmann is snatched off a similarly deserted Argentinean road. Are Arendt and Eichmann both victims of the same heavy-handed rush to judgment? Like Arendt, the film seems to jumble Nazi and Jew, killer and killed, so thoroughly that it confuses itself about which side is which. This is, to say the least, deeply troubling. Arendt’s intellectual triumph seems to require the rhetorical immolation of all rivals, including the State of Israel. “Trying to understand is not the same as forgiveness,” Arendt says, in what is meant to serve as the capstone of her belated self-defense, delivered to a classroom of applauding college students. But Hannah Arendt is more revealing than it intends to be. Arendt does indeed try to understand, but her understanding never extends to the Jewish victims of the Holocaust. She reserves that for Eichmann alone.